Our fifth Tip Jar Jam, December 19, went swimmingly! (I always wanted to use that word!) We were “lighter” than at the last few jams (meaning we had fewer people), but we were all bubbling with enthusiasm. I know I look forward to these Wednesday night gatherings and I think the students do also. We were a Bob short (ha ha—I think that sounds British!) as Bob Van was sick as a dog, bless his heart. Janet and Kenney also didn’t make it so without my two mainstays on guitar I was obliged to play guitar for the entire two hours. Except for the times I pulled out the fiddle to play a twin tune with Suzi. We, along with Bob A, actually did a pre-jam version of Silent Night (in G) while everyone else was getting tuned up and sampling the cookies Zac’s mom, Kathy, had made. Bob had just learned Silent Night (he badgered me into letting him learn it, as he so often does!) and he played it beautifully. Suzi did her usual amazing job of transposing since she normally plays it in the Key of D. It sounded really good with all of us playing the lead together and was a good, Christmassy way to start the jam. I’ll really have to brag some more on Bob A because he took quite a few leads on guitar and did very well. (And he’s only been playing for a year and a half! Yes, he does practice all the time!) Some of the songs he picked lead on were: Blue Ridge Cabin Home, I Saw the Light, Two Dollar Bill, I’ll Fly Away, and Old Joe Clark. I’m a big believer in learning to pick the simple singing songs on the guitar (playing just the melody notes), because these are actually playable in a jam. The harder instrumentals (Salt Creek, Whiskey Before Breakfast, Liberty, Soldier’s Joy) are just that: too hard! More and more I’m realizing that it is the singing songs that make a slow jam work--all instruments can play these. Two of the lovely surprises of the evening came from Jon, who takes lessons from Casey. He actually sang Mountain Dew! I had no idear he could do that. It sounded really good, too, in the Key of A. This song gave Bob Mc a chance to improvise a break and he came through with flying colors! 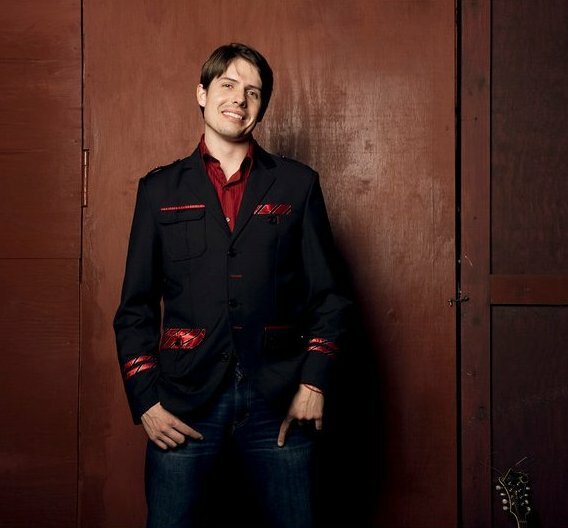 At the end of the jam, when we were officially done, Jon said something about how he liked to play Joy To The World on the banjo. I said, “Have at it!” So he played a lovely rendition of one of my favorite Christmas carols while son Chris and I accompanied him. I asked him if that was a version Casey had taught him and he said yes. I said, not for the last time, that she really comes up with good versions of the tunes she teaches. One more brag about Jon: he is really, really good at playing through his mistakes, which is exactly what you have to do to play in a jam! And speaking of son Chris who is in town for Christmas...He came in toward the end of the jam, joining us on mandolin in the middle of I’ll Fly Away and tremolo-ing away. 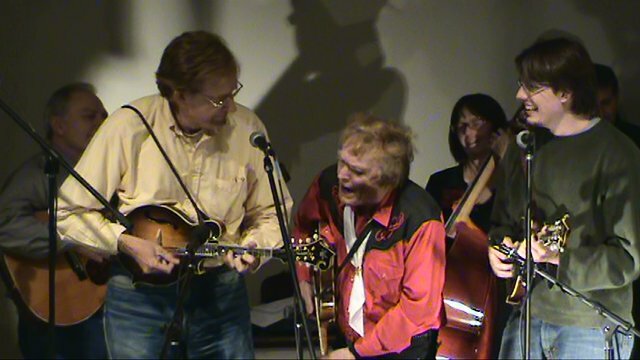 He and I then did a blistering version of Little Girl in Tennessee (mandolin and guitar) after I had declined to try to sing tenor on Bill Monroe’s The Last Whippoorwill, which I don’t know well at all. The jam then moved on to When The Roll Is Called Up Yonder with Chris and me providing the vocals. Then Chris and Zac played a fast instrumental together—I think it was John Hardy—and then we closed out the jam with first a slowish version of Foggy Mountain Breakdown and then Chris and Zac took off on a lightning fast version. Zac, a senior in high school and an excellent banjo player, is so good to come and play slow with us that I was glad he and Chris could cut loose on a couple. Zac and I had done a few fast numbers along and along—Clinch Mountain Backstep, Crying Holy, Sally Goodwin, Salt Creek—with me taking lead guitar breaks on the last too. I figure I can’t very well ask the students to step out of their comfort zones if I don’t step out of mine occasionally! After thanking Barbara for doing an excellent job of holding down the bass duties (always nice to thank your bass player! ), we parted amid cries of “Merry Christmas” and “Happy New Year!” since we won’t be doing a jam the Wednesday after Christmas. But we will be back in the saddle again the first Wednesday in January, January 2, the first Wednesday in the New Year. We have such a good time and the students are improving so much, I urge you to join us if you can. Please call ahead (800-227-2357) if you are coming from a long distance in case of changes. Now, on to breakfast and the tasks of the day which include a final trip to Toys R Us to get one more thing for grandson Dalton! Hope your last five days before Christmas aren’t too hectic! Not the greatest and I could go on but I will spare you! Happy Christmas to all and to all a good night! Posted in By Murphy, jamming and tagged jamming, slow jam, tip-jar jam on December 20, 2012 by Murphy Henry. There are so many different musical situations in Nashville. Often times I find myself surrounded by the best of the world-class professionals, and many other times I like to jam with folks who just do it for fun. There is an event right outside of town called the Full Moon Pickin' Party, and it was a continuation of a party that got started in the 80's by our lawyer friend and bluegrass enthusiast, Ted Walker. The party is located in a beautiful section of Percy Warner park and is attended by several hundred folks every full moon. They have a stage set up and bands play from about 7-11, but the main attraction for most of the folks that come is the jamming. It costs $20 for a regular adult admission, but only $5 if one shows up with a qualified musical instrument. I rode with some friends and got to the park about 9:30 and walked in to see a whole lot of people had showed up as it was a very pleasant Friday evening with perfect weather and a huge Supermoon beaming beautifully overhead. I made the usual rounds and took in the lay of the land as it were. Johnny Campbell, an ardent Bill Monroe style bluegrass fiddler was there with his dad, Bob, and we started off with "The Old Mountaineer". I rarely get to play those tunes and so that was fun. We then played "The Lonesome Old Farmer", a tune that I had learned off Johnny's brother, Jimmy's album that featured Monroe on the mandolin. Another fine moment. My buddy Adam Olmstead, my favorite songwriter under 50, is visiting for a couple of months from New Brunswick, and we sang "Sweetheart of Mine". That was the first song we ever sang together one night at the Station Inn about seven or eight years ago. He usually sings lead, but this night I rendered the verses and sang lead on the chorus. Next, we did the Delmore Brothers tune, "Here Today, Gone Tomorrow", a good jam number that is easy to follow. Then I saw Ted Walker. Ted and I visited and reminisced for a while until he said something to the effect of, "you better get back in there". One of the party's only drawbacks is that it ends promptly at 11pm and that's right when a lot of people are just getting warmed up. So I took his advice and came back to assume my position in the jam. I took a mandolin break on whatever was playing when I got back - I can't remember. I dug in and played hard and loud and the crowd responded, and that was satisfying. We got through with that number and someone asked me to sing, so I thought quickly, then launched into the most recent tune I have learned, the Stanley Brothers' "Paint the Town". I started the tune out by playing the verse and then I sang a verse and chorus to realize that it wasn't a number the folks were very familiar with, and so when the break after the chorus came around, I went into "Say Won't You Be Mine", which I thought would be more familiar. I've had good luck switching tunes at the blink of a hat recently with my band, and I was feeling confident that the switch could be made easily. Wrong!! At these parties, not only is it a little raucous with jams going on every ten feet or so, but the adults of 21 years have the opportunity to consume four complimentary beers with the price of admission. So, folks weren't entirely sober to say the least. When I realized that half of the people were still playing the chords to the original song I had kicked off, I thought it would be a good idea to use my hands to show everybody what chords were in the new selection. Wrong!! The first chord in "Say Won't You Be Mine" is a G chord. It's also what we call the "one" chord in the Nashville numbers system which is used on stage in tight spots but mostly in the studio to write chord charts for folks who have never heard or played the song being recorded before. When I raised my hand to communicate the "one" chord, two things happened: I had to quit playing the mandolin for a moment. and also, with my monodigital articulation, I inadvertently communicated to several that what I wanted was for people to stop playing, as in the one finger meant - "Hold on a second!". So with half of the people in the jam stopping, the momentum of the song had ceased, the song was awkwardly and uncomfortably ended, and I had earned another lesson in what not to do in that situation. Next time I will most likely, A) Play songs that I am quite certain will be more accessible(Rollin' My Sweet Baby's Arms, How Mountain Girls Can Love, etc. ), and B) Don't assume people are going to know what I am doing if I hold up a finger in hopes of communicating the right chords. These are a couple of lessons that I am surprised I had not fully comprehended and put into practice, but it just goes to show, that in the thick of things, it's easy to forget simple things that help avoid getting into a jam within a jam! Posted in General, Improvising, jamming and tagged chris, Improvising, jamming on May 10, 2012 by redhenry. For those who haven't seen the announcements on various music lists, the great bluegrass fiddler Kenny Baker died yesterday in Nashville. Kenny was probably the most influential bluegrass fiddler of our time, having played with Bill Monroe for over 15 years (in itself a record for Bill's sidemen). He played fiddle on all of Bill's classic albums from the late 1960s to the mid-'80s, a nearly-indescribable wealth of bluegrass music which included Bill's great "Uncle Pen" and "Master of Bluegrass" LPs. Kenny's tone, timing, and note choice were the best anywhere, proven not only on his performances and recordings with Bill, but also by the six or seven LPs he recorded on the County label. Kenny was a grand gentleman, and he loved to pick. He said he learned from other musicians all the time. 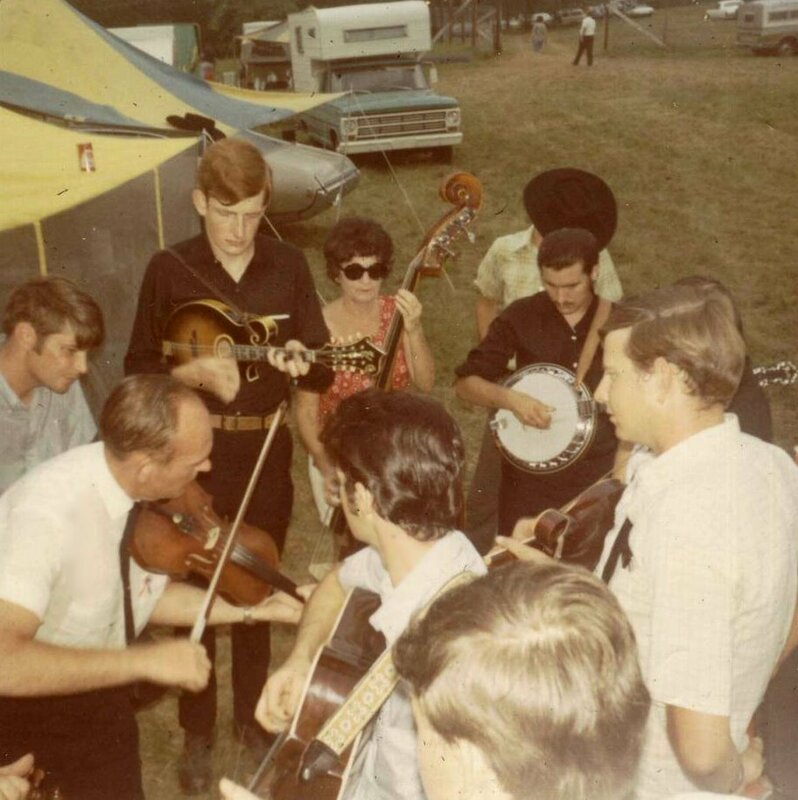 During his tenure with Bill Monroe's band, he often got out in the parking lot at festivals and played for hours with people like you and me. He said that sometimes people gave him trouble for that, saying "That's not professional!" -- and that got his dander up. He would reply to them, "Who's tellin' WHO here, what's professional?" The first time I picked with Kenny was at the Lavonia, Georgia festival in July, 1970. I've forgotten just how the session started, but suddenly Mike and Polly Johnson and I were picking in a circle with Kenny. I think we'd just played Bill Cheatham when Kenny, always encouraging to young players, said his first words to me: "That's good mandolin pickin', buddy." Top: me, Polly Johnson, Mike Johnson. Lower left: Kenny Baker. I often picked with Kenny after that. I lived on the East Coast from 1972-74, attending as many festivals as I could, and during that time Kenny and I often closed out festivals on Sunday night by picking for hours at my campsite. He was a terrific inspiration for this young picker, and I learned a great deal from him. His talent was amazingly diversified--he could play jazz as well as bluegrass and old time tunes, and occasionally groused in private about being restricted to playing "this MON-roe stuff" for a living. On one occasion, Mike Johnson and I and some friends got Kenny away from a festival at Brasstown Bald, Georgia, and brought him to Mike's cabin nearby to pick. We played for a long time that night, and away from the bluegrass crowd Kenny played some real hot fiddle before we had to take him back to the show. Kenny Baker left a huge legacy of music both on record albums and in our memories. Thanks, Kenny! Keep on fiddling. 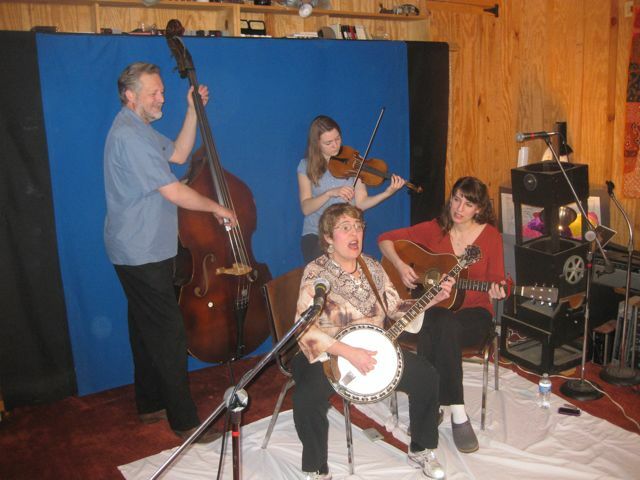 Posted in By Red, jamming, Learning By Ear and tagged fiddle, jamming, Learning By Ear, red on July 9, 2011 by Red Henry. In the last week or so, I've participated in three really different kinds of picking sessions. All three were enjoyable, all three were beneficial (read: good practice), and all three might have hints for Murphy Method students who like to pick. 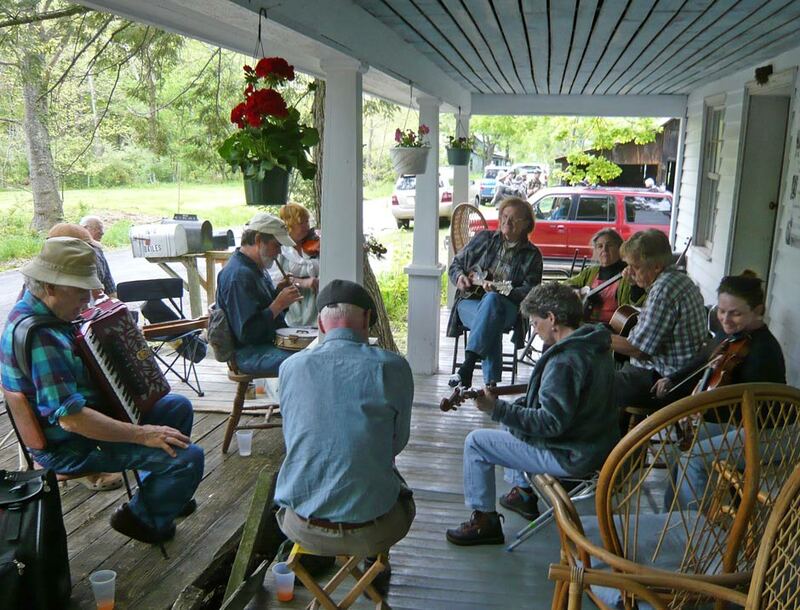 The first jam, on Thursday evening, was the weekly event at Linda's Mercantile and Fruit Stand, a mile or two north of Winchester, VA on U.S. 522. As usual, by 7:00 p.m. we had a full crowd of listeners and a dozen or so pickers, and things got under way. Now, you need to understand that at this Thursday night event, the music is not just for the musicians. It's for the listeners too. And the musicians are not all experts (plus, we don't often have a bass player) so you need to hold the music together the best you can and let the audience enjoy the show. There were about 9 guitar players, 3 fiddle players, 3 banjo players, two mandolin pickers, and a gentleman who alternated between harmonica and spoons. In this situation, holding the music together generally means finding the solidest guitar picker and putting my rhythm 'chunks" right between his down-beats, so that everybody can hear the rhythm. I have a mandolin which will be heard, and so that clear off-beat sound helps all the other musicians stay in time with each other. And then we have to play music for the audience. What do we do? Well, for one thing, before launching into a number it's good to check around to see if some of the other musicians know it. In fact, it's best to stick with well-known tunes and songs altogether, so that nobody's getting lost and everybody can play. Then, when playing or singing lead, you need to get to the front of the group and make sure that the audience can hear what you're playing and singing-- this is pretty important-- and take turns, so that everybody gets a chance to sing or play their favorite numbers, even if they aren't forward enough about it to say they want to. As many musicians and singers as possible, even the shy ones, need to be invited to play. And we did a whole lot of bluegrass and old country songs. It was a good session, and the audience liked it. The second session was on Friday night. This was an old-time session, playing all traditional or traditional-style tunes, held in a primitive cabin over in West Virginia. We had about 12 or 13 players there: 3 or 4 each on banjo and fiddle, plus a couple each of guitars and mandolins, and a bass. We had a wide range of proficiencies in the group, but the players were all involved and paying attention, and knew what to do in a jam. This meant that we all knew many of the same tunes, and nobody was trying to show off, and nobody was holding the group back. We hit comfortable tempos right off on tunes we all knew, and the music was fun and comfortable to play. I had to quit early, but the group went on to a late hour, partly just because the music was going so well. On Sunday night Murphy and I were invited to another old-time session, but this time the situation was different. There were about 9 people there. The majority of them had played bluegrass or old-time music for a living at one time or another, and they were mighty fine pickers. (The few "amateurs" were real good players, too.) Since we were playing old-time instead of bluegrass, though, some of the well-known bluegrass pickers switched off from their regular instruments. Murphy, for example, played fiddle instead of banjo. Cousin David played banjo instead of mandolin. And our friend Marshall was there, but he stuck with his usual instrument and played amazing-as-always bass. And two real pros at old-time music were there to inspire the rest of us. So what did we play? At a session like this, along with familiar tunes, we could bring out a good many fine but interesting and obscure numbers to play. And everybody there listened really well all the time, and kept their rhythm "tight" with the other players. It was a mighty enjoyable time, one of the best old-time sessions I've ever played in, in spite of the fact that the majority of the musicians were not old-time, but bluegrass players! So what does this musical peregrination show? It shows that you can enjoy a lot of different musical situations. It doesn't have to be all bluegrass. You can have a great experience playing many different kinds of music. Just relax, keep your ears open, "play together" with everybody else, and have a good time! Posted in banjo, By Red, jamming, Learning By Ear, Practice and tagged banjo, fiddle, guitar, jamming, Practice, red on July 6, 2011 by Red Henry. ...I expect that we'll play there again next year. So if you're ever in this part of the country and would like to visit a place where (as far as I can see) not much ever happens, and it's good that way, drive through North River Mills. But don't blink-- you'll miss it! Come next year. Bring an instrument. You don't have to be an expert. If you don't know the tune, just play rhythm. You just have to like to play! 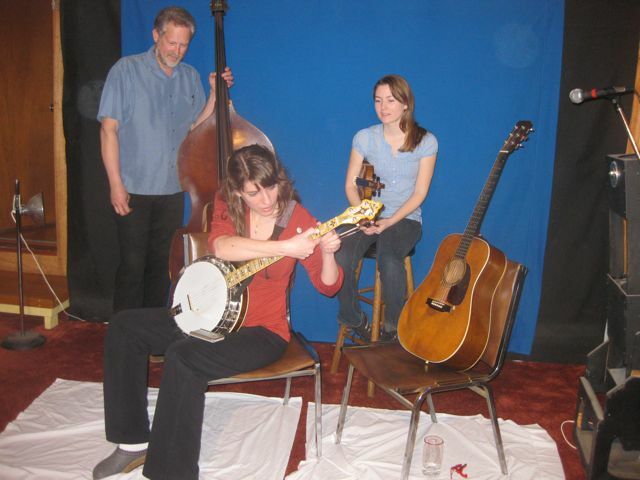 Posted in By Red, jamming, Music and Video, pictures and tagged fiddle, jamming, red on May 13, 2011 by Red Henry. Last Thursday and Friday Red and Murphy and I gathered in Winchester, Va. (Well, I gathered. They were already there.) to film our new jamming DVD. (That possibly had something to do with the profound lack of blogs that got posted last week!) Since our two slow jam DVDs are so popular, we wanted to offer students even more opportunity to practice jamming, but we also wanted to challenge you a little. So this time we did a fast jam DVD. There will be twenty-one songs on it--mostly new ones, but we also repeated a few classics: Lonesome Road Blues, Cripple Creek, John Hardy, and Mama Don't Allow. Steve Spence, Casey Henry, Malia Furtado -- capoing up to play "Whiskey Before Breakfast"
The filming went great, although it didn't exactly follow our original plan. We were going to spend Thursday and Friday taping, with Saturday as a spare day just in case we needed it. Well, we woke up Thursday morning and Red was sick---unable to run the camera. So we had to scratch Thursday. (It wasn't a total loss though since Murphy and I played a great game of Scrabble and I beat her! I don't think that's ever happened before.) Scratching Thursday meant that we didn't get to use David McLaughlin, who was going to join us on mandolin that day. He was busy both Friday and Saturday, so as a result, there's no mandolin on this release. But, you'll be happy to know, there IS bass this time. Our long-time friend Steve Spence joined us playing bass, and we were grateful that his flexible schedule allowed him to come Saturday on such short notice. On fiddle you'll recognize Malia Furtado who played some great, bluegrassy breaks with little advance warning and NO practice! Steve Spence, Malia Furtado, Murphy and Casey Henry practicing for the next tune, which is clearly a singing song, though I don't remember which one. We ask more of you, the student, on this fast jam disc. The tempos are close to what you'll find in a regular jam session. In the intros to the songs we give you a heads up as to what chords we'll be using in the song, but the guitar left hand will not be in a box on screen. To be sure you can see the guitar player's left hand on the screen the whole time (usually me, sometimes Murphy), but it's part of the wide shot. And we've included the Murphy Method theme song Hazel Creek, which is in the key of G minor, yes, that's right, minor. That will probably be a new vamp chord for just about everybody! We will have the DVD out by the beginning of June for sure (in time for Kaufman Kamp! ), but we're still trying to think of a title. Suggestions? Posted in By Casey, DVDs, jamming and tagged fast jam DVD, filming, jamming on March 7, 2011 by Casey. ...as you can see, we were having quite a time. Or, to "talk backwards" and put it in Wakefield-ese, Frank and "Leeroy" and "White" didn't play no music. We didn't have no fun. And you can't see it right in this picture! Posted in By Red, Improvising, jamming, shows and tagged chris, jamming, red, shows on February 4, 2011 by Red Henry.